Shree Somnath Sanskrit University Result 2019 www.sssu.ac.in: The university offers various courses starting from Certificate to Diploma, Graduation, PGDCA, Acharya, B. Ed, M.Phil, PhD and many more. Shree Somnath Sanskrit University (SSSU) conducted this examination once in a year and publish the result in different time and dates. Shree Somnath Sanskrit University, Veraval was established by Government of Gujarat on April 1, 2005. Academic Sessions of Colleges began from June 2006 and Post Graduate Sahitya Department was established on July 20, 2006. It is the Public State University with Sanskrit as its medium of instruction. At present, more than 4141 students are registered in the University affiliated Colleges/Institutes/Centers in the academic year 2014-15. At Shree Somnath Sanskrit University, B.A. Course is referred to as Shastri and M.A. Course is referred to as Acharya. The University makes advertisements regarding its M.Phil. and PhD courses from time to time and students are admitted to these courses through University level entrance exams. 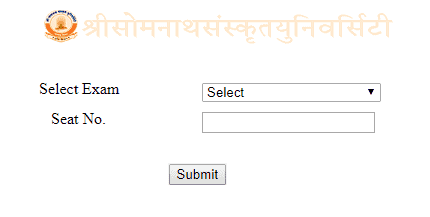 To check the Somnath Sanskrit University Result students should visit their official website. The previous official website was www.shreesomnathsanskrituniversity.info but this time it has new version www.sssu.ac.in and easy to remember. Open your computer browser and type www.sssu.ac.in. In the main menu check “Exam Section”. Under this menu click on “Result”. Finally, enter your Seat No. and click on Submit button. N.B. You may download or print the Shree Somnath Sanskrit University Result 2019 for future reference. But you should also collect the original mark sheet from the university or respective colleges.